The pollutant load from lifestyle and industrial activities has caused environmental deterioration in the Seto Inland Sea, Osaka Bay and other enclosed coastal seas in Japan. This has resulted in red tides and oxygen-deficient water masses that have created extensive areas where sea creatures cannot live. To resolve environmental problems, many people — not only specialists and government officials but private citizens including children — must learn about, be aware of and understand these problems, and then consider solutions and act to implement them. In order to promote efforts relating to environmental problems in the ocean, it is important for people to actually come in contact with and experience the ocean so they can gain an understanding of ocean environments. Using training facilities located off the coast of Amagasaki that are owned by the International EMECS Center, programs for elementary and junior high school students and the general public are held to teach people about the functions of the ocean, the function and role of the shallows, the current state of Osaka Bay and Amagasaki Bay, and the living creatures that inhabit the ocean. These hands-on educational activities give people the opportunity to learn about, come into direct contact with and think carefully about the ocean. Along with the technical development and policy execution efforts that are currently underway, it is important to provide opportunities for the general public to join researchers and others in coming in contact with and learning about ocean environments, and to upgrade the content of these programs. 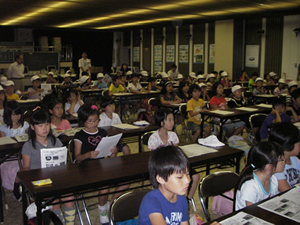 Accordingly, seminars consisting of lectures, symposiums and experience-based learning in actual ocean settings were held in FY 2001 and FY 2002. 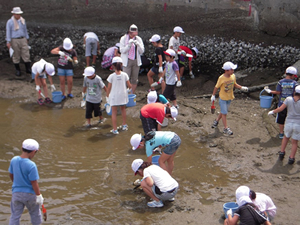 Using facilities such as the “Tidal Flats, Rocky Seashore and Lagoon” located in the Amagasaki coastal zone and operated by the International EMECS Center, programs were held for elementary and junior high school students and members of the general public in the Osaka-Kobe region. 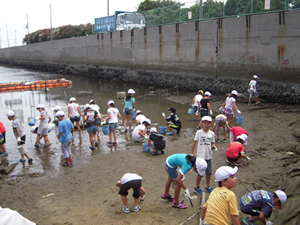 Located in inner Osaka Bay, Amagasaki is an area that has lost much of its natural environment. 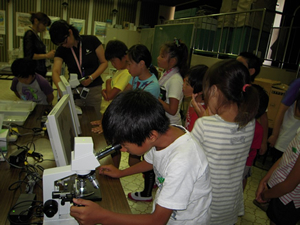 The programs were held to teach participants about the functions of the ocean, the function and role of the shallows, the current state of Osaka Bay and Amagasaki Bay, and the living creatures that inhabit the ocean. 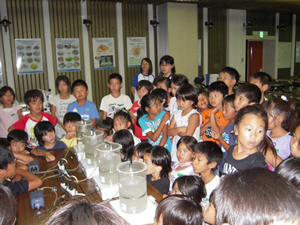 Led by researchers who are on the front line of ocean research and development in Japan, these hands-on educational activities gave participants the opportunity to learn about, come into direct contact with and think carefully about the ocean.